Losing Our Religion: The Growth Of The 'Nones' : The Two-Way As religious as this country may be, many Americans are not religious at all. 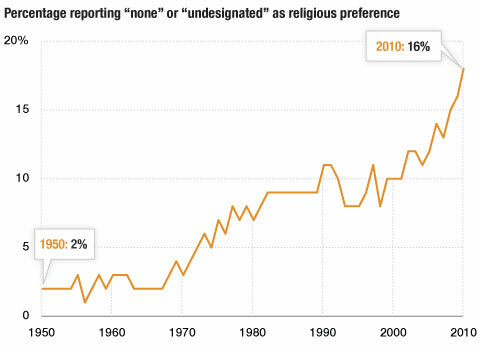 The group of religiously unaffiliated – dubbed "nones"-- has been growing. 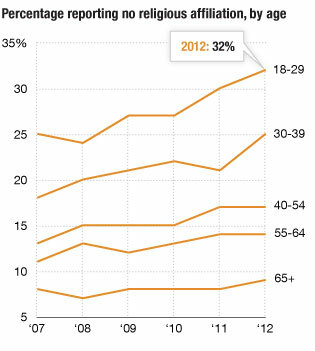 One-fifth of Americans say they're nones, as are one in three under 30. They're socially liberal and aren't looking for an organized religion. This week, Morning Edition explores the "nones" — Americans who say they don't identify with any religion. Demographers have given them this name because when asked to identify their religion, that's their answer: "none." Perhaps most striking is that one-third of Americans under 30 have no religious affiliation. When comparing this with previous generations under 30, there's a new wrinkle, says Greg Smith, a senior research at Pew. "Young people today are not only more religiously unaffiliated than their elders; they are also more religiously unaffiliated than previous generations of young people ever have been as far back as we can tell," Smith tells NPR Morning Edition co-host David Greene. "This really is something new." According to Harvard professor Robert Putnam, who writes about religion, this young generation has been distancing itself from community institutions and from institutions in general. "They're the same people who are also not joining the Elks Club or the Rotary Club," Putnam tells Greene. "I don't mean to be casting that as a critique of them, but this same younger generation is much less involved in many of the main institutions of our society than previous younger generations were." The trend, Putnam says, is borne out of rebellion of sorts. "It begins to jump at around 1990," he says. "These were the kids who were coming of age in the America of the culture wars, in the America in which religion publicly became associated with a particular brand of politics, and so I think the single most important reason for the rise of the unknowns is that combination of the younger people moving to the left on social issues and the most visible religious leaders moving to the right on that same issue." The religiously unaffiliated voters are almost as strongly Democratic as white evangelicals are Republican, polls show. So far, the trend has not translated to more nones in Congress, according to Pew. Only one member of the new Congress — Democrat Kyrsten Sinema of Arizona — identifies as a none. Democrat Pete Stark had been Congress' sole atheist, but he was defeated in November. Still, religion still rules in America, as Putnam tells Greene. "Even with these recent changes the American religious commitments are incredibly stronger than in most other advanced countries in the world," Putnam says. "The average American is slightly more religious than the average Iranian, so we are a very religious country even today." Check back later, and we'll add audio to the top of this post when it is available. Click here to find a station to hear Monday's interview and the rest of Morning Edition's Losing Our Religion series.